New Impression Obsession Challenge - All That Glitters! Pink and Green Challenge Winner! 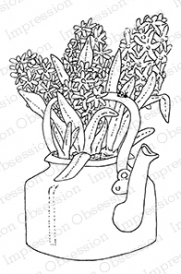 Meet The Impression Obsession Artist! Dina Kowal! 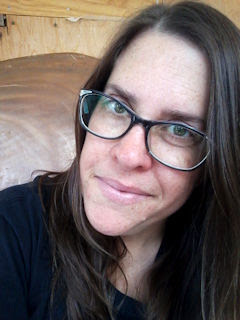 Design Team Feature Thursday - Ilina Crouse! Pick a Holiday Challenge Winner! 2018 Spring Die Hop Winners!!! Today is the big day! We are excited to be part of this exciting event. We have partnered with 17 other stamp and papercraft companies to do a special blog hop and will be giving away 18 prizes to 18 lucky winners! Impression Obsession Stamps - You are here! Graduation is just around the corner and we have some wonderful new dies for cards for your favorite grads! 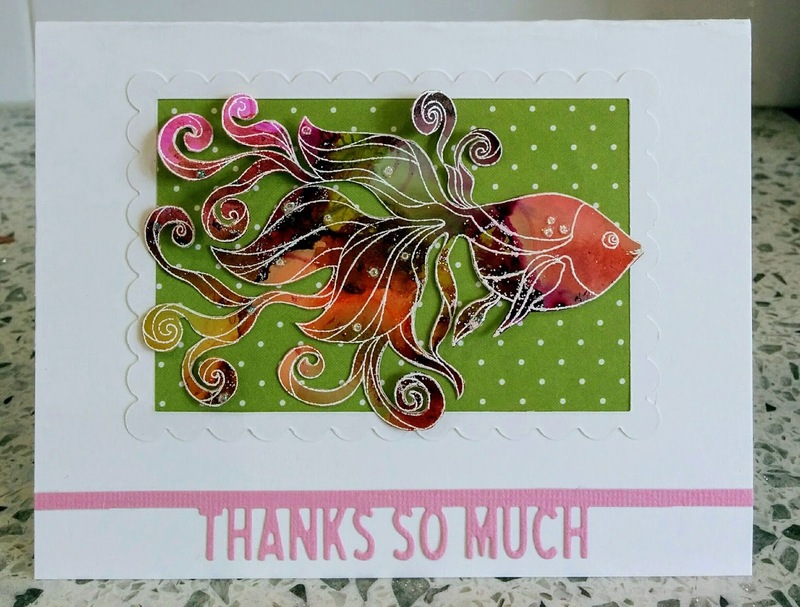 This card from Jeanne Streiff uses our new DIE682-P Congratulations and DIE673-L Grad Group Border dies on a colorful Color Burst background. This Challenge will be open until Tuesday, May 8th at 7 p.m.Central Time. Winner will be announced May 9th. Thank you to everyone who entered our Pink and Green Challenge! Please email Jeanne within 7 days for your Gift Certificate info. Check out her beautiful card! Hi everyone! I'm so excited to be kicking off a series of Meet the Artist posts to help you get to know the illustrators that create your favorite stamps! I'm Dina Kowal, and you'll find my stamp art HERE - if you like thoughtful and inspirational quotes, quirky cute animals, sentimental silhouettes, floral and natural elements. layered sets and vintage collage, you're sure to find something you like in my collection! I love animals - in fact, when I'm not stamping or creating stamp art, you'll find me working on commissioned pet portraits. 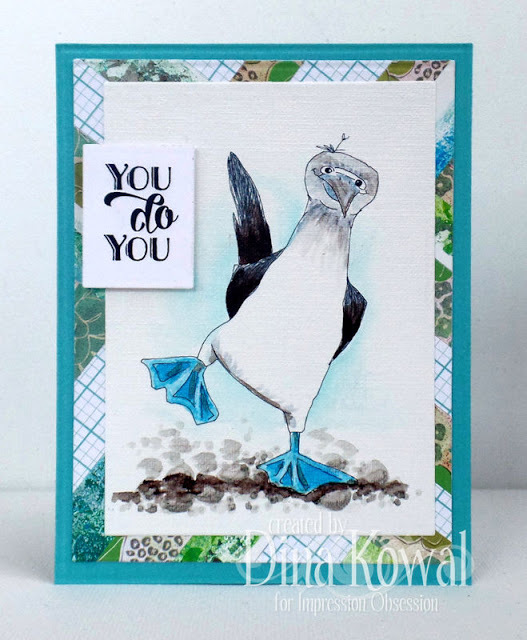 For stamps, though, I love quirky animals that make me laugh - this booby is definitely one of my favorites! I have a gift for spotting irony, randomness, and amusing typos. I always wear fun socks - in fact, I pick them out in the dark so they're sure to never match my outfit! I love words. And charts, especially color charts. Whatever the coloring medium is, I need the big set. I adore Winnie the Pooh (as A.A.Milne conceived him) and have always related to him most, though I always come out Owl on those silly quizzes. I love all kinds of music, especially crooners and WW2 era songs. Thanks for visiting today - you can find me stamping at Dina Kowal Creative or at Splitcoaststampers! Today's featured Designer is Ilina Crouse! This Challenge will be open until Tuesday, April 17th at 7 p.m.Central Time. Winner will be announced April 18th. Thank you to everyone who entered our Pick a Holiday Challenge! Take a look at Beth's beautiful card! Thank you to everyone who hopped with us!